I’m experiencing mild frustration at some of the preconceptions I’ve encountered about the Burgman. If you’ve read my replies to reader comments under my previous blog entries, you may have detected a hint of defensiveness. Although I’m really enjoying using the Burgman, for example, people keep telling me to get rid of it. So far five reader comments have recommended this course of action. Snev memorably suggested I ‘ditch this poofter cack and get a real bike’. Clearly a progressive thinker. I think there are serious misconceptions about the Burgman, too. There’s the recurring suggestion that, because it’s a scooter, it ‘should be cheap’. Why? Are scooters cheaper to produce than motorcycles of the same capacity? But today I’d like to challenge a suggestion I read elsewhere that the Burgman is too big for filtering through traffic. I know the Burgman is actually very good for this because I do it every day. To quantify the issue, I’ve been out in the office car park measuring bikes with a tape measure. Yes, it looked weird. 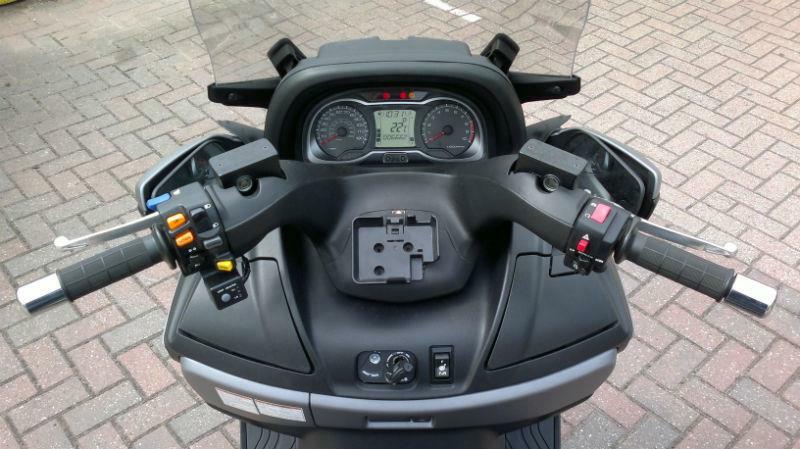 The Burgman’s mirrors fold back at the push of a button for filtering, leaving it 80cm wide from bar-end to bar-end. That’s 16cm narrower than a Ducati Multistrada at its widest point, from mirror to mirror. It’s 16cm narrower than a Honda Shadow 125. It’s 13cm narrower than a BMW R1200GS and 10cm narrower than a Ducati Hypermotard. It’s 9cm narrower than a Yamaha Fazer 800 and a Triumph Street Triple. It’s 3cm narrower than a BMW S1000RR. So there we have it. The Burgman 650 ABS Executive is faster through traffic than a BMW S1000RR. Not my opinion but the findings of empirical research. And I realise I’m at risk of sounding a little like Alan Partridge.